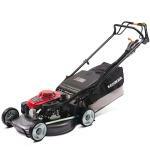 The latest Honda HRU196-M Buffalo is a solid construction, professional quality, mulching and catching lawn mower. Now with the added feature of a safety 'blade cut-out brake' for improved operator comfort and safety. This 19" wider-cut model suits the operator who knows the benefits of greater speed when mowing, plus appreciates the performance and durability of a genuine Honda engine. Ideal for professional users, schools, commercial properties, rest-homes, or larger domestic lawns.